C74) Ezekiel 38, the Gog of Magog War, Israel, Followed by a Move of Gods Spirit in the Middle East, (S. Dobbs, 2002). Watchman update 29th, March, 2018: Someone else has received a prophecy which predicts that Gog of Magog will be a religious leader, if so then these events will not take place until after President Erdogan has left or been removed from power in Turkey. However, Turkish forces are already planning to attack the Kurds in N. Iraq. President Erdogan has also recently called for a coalition of Islamic forces to attack Israel, link. I received this prediction from the Holy Spirit in 2002. This was initially placed on the old version of this website in 2005. I had to replace that site in 2015 due to its outdated security and repeated hacks. This links to words Nos A10, B1 and C75. Introduction: I received this word from the Lord as I was reading through the book of Ezekiel in November 2002. Please read all of Ez Ch 38 which refers to a future failed attempt by Gog of Magog to destroy the nation of Israel. The following word predicts the event that will immediately precede the Ez 38 war so that Christians will know when these things are about to happen. This 2002 word also predicts that there will be a move of Gods Spirit out to the Islamic World after the events of Ez 38 have taken place. It contains information about Gog of Magogs plans which will remove barriers in the minds of Muslims to help them respond to the gospel of Jesus Christ during this move of God. The prophecy: As I was reading Ezekiel 38, verse 10 stood out, highlighted by the Holy Spirit. I have used both the K.J.V as well as the N.K.J.V here as I think the latter adds clarity to this particular verse. This refers to thoughts/plans that Gog of Magog will have towards Israel. K.J.V - Ez 38;10, "It shall also come to pass, that at the same time shall things come into thy mind, and thy shalt think an evil thought,"
N.K.J.V - Ez 38;10, "On that day it shall come to pass that thoughts will arise in your mind, and you will make an evil plan." As I continued to look at the scripture a map appeared in my minds eye. Although I had no knowledge of geography of the area I saw straight away that this was of the northern border of Iraq, where it met that of Turkey to the north and Syria to the west. Later, when I checked this with the atlas this proved to be the case, (I've circled this here and included it on a larger map of the region to give it context). I then saw that Turkish troops would occupy this small area of Iraq and that this would be a sign to us that the events of Ezekiel 38 were about to take place. [The Turkish invasion of this small area of Kurdish Northern Iraq will, therefore, alert and prepare Christians for the events of Ez 38 that will follow shortly after this]. The Holy Spirit then showed me that in the scripture Magog was the name for Turkey and Gog referred to the leader of Turkey who will invade this area of Iraq. I also understood that Gog of Magog will masquerade as an Islamic leader. He will make false claims about a desire to liberate and unite the Muslim people in order to gain popularity for his "evil plan" across the Islamic world. I saw that after Gog of Magog has occupied this area of Iraq he will move his Turkish forces down to the border of Israel as predicted in the scripture. He will also make a pact with the Iranians to divide and occupy the central part of the Middle East, (i.e. divide Iraq), between them. Iranian forces will also move across the Middle East to join with Gog of Magogs coalition of forces on the borders of Israel. When the rest of the events of Ezekiel 38 have taken place, and Gog of Magogs coalition of forces have been destroyed, I saw there was then going to be a move of the Spirit and the gospel out to the Islamic world. The Lord showed me He wants Christians to have the correct attitude towards Muslims so that we ourselves do not become stumbling blocks to them turning to God. The Lord wants Christians to view Israel's Arab neighbours as Israel's brothers, which indeed they are as descendents of Ishmael, the son of Abraham, (see Gen Ch16). We are to inform the people of these nations that the Lord is for them and is offering them the same gift of salvation that He is offering Israel. After Gog of Magogs forces are destroyed we are also to inform the people of the Islamic world that Gog’s beliefs had been insincere, that he had been using their religion, Islam, as a means to promote his own political and military ambitions within the region, that his reasons for attacking Israel had been strategic rather than religious. That he had reasoned that such an attack would give him great prestige within the Islamic world and legitimacy amongst many Arab Muslims for his wider plans for expansion within the Middle East. That Gog of Magog had then intended to invade the weaker Arab nations in the region, asserting religious and political pressure on the stronger Arab nations later, so that he could emerge as the leader of a powerful Middle Eastern Empire. Once Gog of Magogs "evil plan " of Ez38; 10 has failed the Lord would like us to provide Muslims with the enclosed information as this will remove barriers in their minds, give them understanding, and help them receive the gospel of Jesus Christ during the move of Gods Spirit that will follow these events. S Dobbs, typed in 2003, first placed online in 2005. Note added in Oct 2009 and updated in 2015: In early 2003, several months after I received this word, (and had been busy moving flat), my attention was drawn to the fact that in this scripture none of Israel's immediate Arab neighbours are named as part of Gog of Magog’s alliance in Ez 38. I thought God was ministering this to me but as it did not come in the form of a prophecy so I wasn’t certain at first. It was almost as if I could see the words appearing in my minds eye as if written down as I was wondering about my new flat focussing on ordinary daily activities. What I perceived was that the bible doesn’t mention any of the nations or tribes that correspond with today’s nations of Syria, Egypt, Iraq, Jordan, Lebanon or Saudi Arabia as being in Gog of Magog’s alliance that attacks Israel. This is surprising since it is these nations that have previously led the wars against Israel. The Gog of Magog attack is not, therefore, a continuation of the present struggles in the Middle East but, instead, something completely new. I saw that it was only the nations that form a ring around the outside of the Arab nations Gog that are part of this attack, (see Ez 38, v's 3, 5 and 6). I understood that Gog wanted to secure his intended Empire by surrounding it with friendly nations. I have drawn these on the following map, (please excuse the poor quality). The area in the centre is approximately the area of the initial Empire Gog of Magog wanted to create using an attack on Israel as his pretext/excuse to execute this. [We can see that in so doing Gog of Magog would gain control of most of the Middle East’s oil reserves and therefore great power and wealth. This Empire is also very similar to the previous Ottoman Empire which was ruled by Turkey. BY being surrounded by friendly nations it would be that much harder for others nations, possibly the USA, to invade in a bid to fo9rce the Turkish forces out]. There is, therefore, great strategic logic in Gogs "evil plan" and the Lord wants Christians to be equipped with knowledge about this so we wont get in the way of a great move of Gods Spirit out to the Islamic World, particularly the Arab world, that will take place after this. This knowledge should assist Muslims in turning to Christ. The nations Gog wanted to directly occupy he left out of his alliance against Israel. I understood that this was a major part of Gog of Magog's "evil plan" in Ez 38; 10. [This would make sense because if Gog had invaded Muslim nations that he was in alliance with this would not be regarded well by the rest of the Islamic would, who would then become suspicious of his motives, Gog would then loose legitimacy as an Islamic heroic leader and saviour figure, he could then be rejected as the man sent to unite Islam. It is possible Gog of Magog may even claim to be the Islamic Messiah, the Mahdi who many Muslims are presently expecting, although I was not shown this]. Since 2002/3, (when I received the first prophecy, above, and this subsequent revelation), much of the Islamic world has fallen into chaos due to the Iraqi war, local Arab uprisings against dictators and civil wars. The Islamic nations of Egypt, Syria and Iraq are all left weak without a strong or unified leadership. These are the nations the previous prophecy had predicted that Gog of Magog would want to incorporate into his Empire through passive occupation or invasion. This is why, according to the scripture, Gog of Magog will not include these nations in his alliance against Israel]. I saw that the tribes and nations that are named in the bible as forming part of Gog of Magogs alliance are almost all Islamic today. Gog of Magog therefore intends to form an Islamic coalition of forces that surround the area he intends to become his Turkish Empire. [Apart from Iran most of the Islamic nations that form part of Gogs coalition are also weak and would probably wish, or could be coerced into joining Gogs larger Turkish Islamic Empire at a later date, Libya for example]. The first tribes and nations named in Gogs coalition are Meshech, Tubal, Gomer and Togarmah, which, on maps in my study bible, are all locations in modern Turkey today. [Note; I dont feel the need to become an expert on this subject, others can and have investigated these things in more detail, this is largely a prophetic revelation which I am giving supporting notes to here, not a scholarly account of the history of this region]. Another nation named in the scripture, though, is Persia, which most will agree correlates with modern Iran today. The others are Libya and Ethiopia. All apart from Ethiopia are Islamic nations today and are, therefore, likely to support an attack on Israel in our day. Furthermore, whilst modern Ethiopia is mainly Christian ancient Ethiopia covered much of todays Sudan which is now Islamic. Somalia and Eritrea also occupy part of ancient Ethiopia and have strong turbulent Islamic forces operating within them today. This year, 2015 the Isalmic opposition in Eritrea, which opposes the government there, even formed an alliance with Turkey. 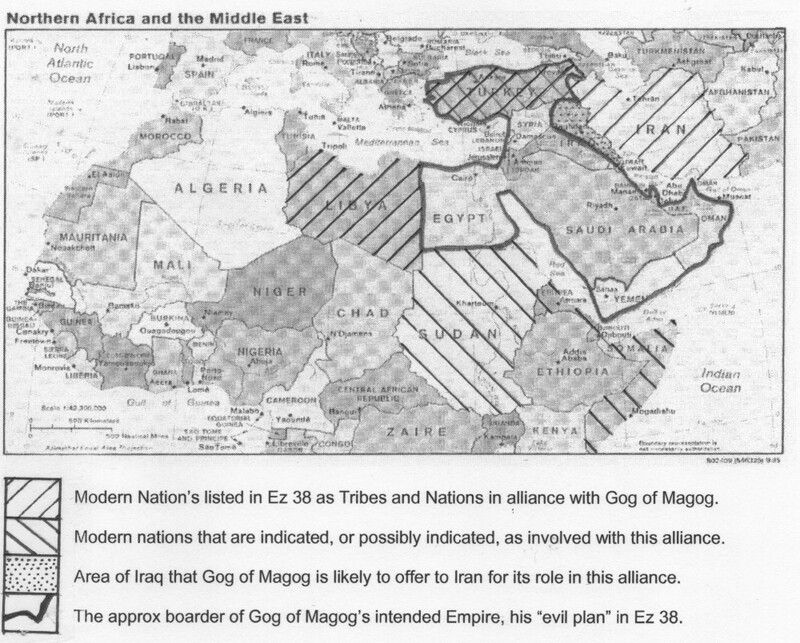 Most of the area named in the bible in regard to Gog of Magogs alliance are, therefore, definitely Islamic today. This support the above prophecy which predicts that Gog will masquerade as an Islamic leader sent by God to liberate and unite the Islamic people of the Middle East, (and possibly also beyond later on too had his plan not failed). Non of Israel’s immediate Arab neighbours, and main enemies in modern times, are named in this attack though. This is Gog of Magog's "evil plan" of Ez 38; 10. I wouid describe it as a plan to recreate the Turkish Ottoman Empire. As I understand it many Muslims are expecting the arrival of their false Messiah, the Madhi. It is possible, perhaps likely, that Gog of Magog intends to deceive them by portraying himself as the Mahdi in order to gain acceptance for his evil plan. The main point of the prophecy above was for Christians to know that Gog of Magog will ne insincere, a deceiver of the Muslim people and not really be a devout Muslim at all. This information will assist Christians in their presentation of the gospel across the Muslim world after these events. God does not want us to become stumbling blocks especially not to Israel's Arab neighbours many of whom will be turning away from Islam to Christ after this war. Note added 2015: It may be worth noting that Iran is unlikely to be privy to Gog of Magog’s plans for a greater Turkish Empire. 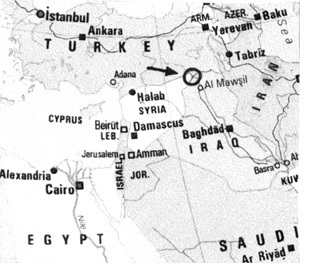 Gog probably intends to outwit Iran who would only gain half of Iraq and perhaps part of Kuwait whilst Turkey would gain a vast amount of territory if Gog’s plans worked. The alliance with Iran would also protect Gog’s potential empire to the east. It may also give greater legitimacy to Gog as an Islamic saviour amongst the Shiite as well as Sunni Muslims as Iran is a powerful Shiite nation. 2009/15 note continued: In Gen 10: 2 Magog is named as one of Japheth's sons along with Gomer, Javan, Tubal and Mashech which are, again, all associated with locations in modern Turkey. However during the cold war many Christians in the west started believing that Russia would be behind Gog of Magogs attack on Israel. The Lord did not show me whether or not Russia will support this attack but Russia clearly wasn’t included in the prophecy I received. I’ve included the following notes here as my prophecy contradicts this popular belief. The term "from the far north" in Ez 38 verse 6 and 15 has been used by many to support the view that the attack on Israel will be led by Russia, as Russia is to the far north of Israel. However the scripture also says "Togarmah from the far north" (v. 6), and as Togarmah is associated with an area near Turkeys eastern border, modern Turkey could also be said to be in the far north from this Old Testaments prophetic perspective. Ez 38 verse 3, "Gog, the prince of Rosh, Meshech and Tubal," (N.K.J.V). In this scripture many have suggested that "Rosh" stands for "Russia" because of the similar spelling but I am told that there is no linguistic reason for this. Apparently in Hebrew "Rosh" means "Head," not the name of a nation. As far as I am aware in Hebrew there is also no differentiation between small and capital letters. Verse 3, would, therefore, be read "GOG THE PRINCE OF HEAD MESHECH AND TUBAL." The King James version of the bible is known to be a more scholarly superior to the modern versions and this interprets verse 3 as follows, "Gog, the chief prince of Meshech and Tubal." There would appear, therefore, to be no scriptural reason why Russia should be seen as in any way connected with Gog of Magogs attack on Israel. "Meshech and Tubal", however, are named places and both are thought to have been located in what is modern Turkey today. The above prophecy that I received would, therefore, appear to agree with the bible contrary to the false interpretation many modern Christians have been giving for Ez 38 and linking this to Russia. I expect the cold war with Russia influenced peoples thinking and expectations in this way. From a natural point of view this would also now appear unlikely. Many don’t realise that Turkey has created one of the world’s largest armies, possibly due to the threats of former Saddam Hussein’s Iraqi threat to the east, the threat of Israel to the south and Russia to the North. It seems extremely unlikely that the proud Muslim nations named in Ez 38 would submit to an invasion of Russian forces through their territory or be part of an attack on Israel under the command of a Russian leader. It may be likely they would combine with Russian forces, though. However, that is not what the Lord showed me in the above prophecy. I saw that this would be a totally Muslim led armed attack against Israel. Or rather an attack undertaken by a Turkish leader, Gog of Magog, using Islam as his excuse in an attempt to build a renewed Turkish Ottoman Empire in the region. I was shown of no Russian involvement at all although in today’s political climate perhaps the Russians may not oppose this. 2009 note continued: The revival that follows these events will probably be part of a larger global move of God, i.e. wider than just to the Islamic world. If so this prophecy is focusing attention on this particular part of that larger global revival, i.e. on the end times move of Gods Spirit amongst Muslims. The Holy Spirit revealed the following to me as I was worshipping in the spring of 2003. This may sound a bit ambiguous* but I felt that a move of Gods Spirit would take place amongst many in the Muslim world because of a merciful sovereign heart move of God toward them, almost because of the sense of injustice and/or desperation that many of the poorer Muslims cried out from*, i.e. not because the church had been praying for them in particular. When Gods Spirit moves toward them Jesus Christ will then be revealed as God, the Son of God, to many Muslims who will then convert and follow Him. *This is ambiguous because I don’t quite understand it myself, God obviously won’t answer people if they pray to Allah. Maybe Muslims will cry out to the God of Abraham who they believe in? It is known that Muslims believe in Jesus as an important prophet too. Perhaps after the crushing defeat of the Muslim armies in the Gog of Magog war described above many Muslims will lose their faith in Islam and start to cry out more generally to the God of creation in the way people did in Genesis, in the days before God revealed Himself more fully to Abraham, and in the way many unbelievers in other parts of the world often cry out to the creator God today, even though they don’t understand who He really is, perhaps as part of the process as they move towards salvation through Christ? It is also possible/likely that the fulfilment of the ancient Ez 38 prediction of the O/T will result in many Muslims wondering if the Jews are in fact the chosen nation after all and if Jesus is indeed the Christ, especially as many Jews will then receive Christ, see word No C75. The main point I felt from God, though, was that the church in the main will not be responsible for initiating enough prayer to stimulate this move of God towards the Muslim world, particularly the move amongst the Arab Muslims. Instead it will come directly from God without much prayer from us on their behalf. We should, therefore, be humbled by this and not proud as if it were down to our witness to the Muslim people more generally. The western worlds Christians will definitely not be the reason for this move of God amongst Muslims in the end times. Note: There are reports of many Muslims getting saved miraculously without the normal preaching of the gospel to them as they experience visions of Jesus instead. This may reflect an early stage of the above move of God. Note 2015: We know that many former Muslims have also been martyred for Christ in recent years and there is perhaps nothing more powerful than their blood and prayers crying out from the ground to God for their Muslim families and nations to turn to Christ. The Islamic World has also since been plunged into turmoil by the invasion of Iraq and various civil wars so the Muslim people in those areas will have become increasingly desperate since i received that prophecy. I’ve just realised that these nations include Iraq, Syria, Egypt, the very same nations that the Lord had shown me, in 2002, that Gog of Magog would intend, (but fail), to make part of his new Turkish Empire, as part of his evil plan in Ez 38. Note 2015; Salvations amongst Muslims have continued to increase at an astonishing rate since 2009, with so many converts to Christ that some Muslim nations, for e.g. Egypt, could now be considered to be almost on the edge of revival. Furthermore Ez 39; 29 speaks of the Spirit of God being poured out on Israel after the Gog of Magog attack of Ez 38. Imagine the effect this would have on the Islamic nations that are already being influenced by the gospel and becoming increasingly disenchanted with Islam, the inter- Islamic violence of ISIS and other groups. This prophecy, C75, also relates to this issue. Note, May 2016: It may well be the prayers and the sacrifice of many converted Muslims as martyres that will prompt God to cause this move of God amongst Muslims nations. That would make more theological sense. The point is, though, that this will not be the result of anything Christians in the western world have done.